There’s a long tradition of non-American guitarists making a pilgrimage of sorts to the United States to get in touch with some of the roots of their instrument. German guitarist Micha Schellhaas, after years of session work in Europe, decided to move to the US and delve into the history of blues, country, and rock guitar. On Double Take, he’s teamed up with Chad Wackerman (drums), Dave Marotta (bass), Jim Cox (keyboards), and Carl Verheyen (production and additional guitar). Wackerman needs no introduction here, as we’ve been covering his work for years. Cox has played with a wide variety of artists, from straight jazz to Barry Manilow and Weird Al. Marotta and Verheyen are also studio veterans, with Verheyen a member of latter-day Supertramp. On these nine tracks, Schellhaas displays expertise and taste on idioms ranging from the blues to New Orleans funk to hot countryish picking to slick jazz. In addition to his own solos on acoustic, electric, and slide guitar, Schellhaas leaves room for Cox lay out some tasty organ and piano (acoustic and electric). I’m often reminded of Harvey Mandel’s work in the 70s – guitar playing that (often) transcended genre limitations, inventive though not outrageously flashy in a technical sense. So don’t expect any flurries of 64th notes or tricky workouts in odd meters (except on the aptly titled “5&6”). This is just a really well done guitar album rooted in the blues but willing to wander a little ways outside the strict confines. Along with the previously mentioned Mandel, Steve Morse is a good reference. 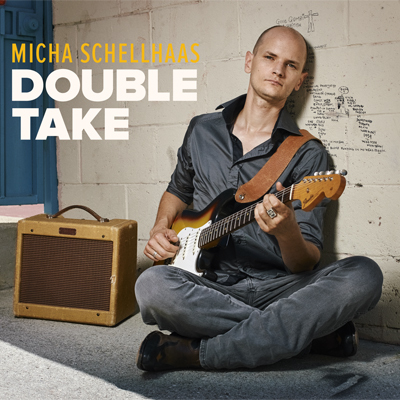 With Double Take, Micha Schellhaas proves that he’s got the styles down – now he needs to move on and develop a distinct style of his own.